Swatching is not only dull and boring, but I decided to use my most dull and boring colours (with the exception of the patch of orange at the bottom left), to save the bright colours for the sweater. 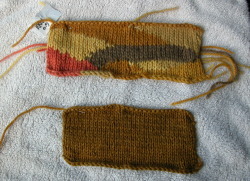 This gave me a chance to brush up on intarsia knitting (connecting blocks of different colours), and it looks as if this will go more smoothly than I’d anticipated. Originally I’d planned to knit the sweater in the round, then (sharp intake of breath!) cut it up the middle to make a cardigan. It is possible to do intarsia in the round, but after four or five rounds, I realized it would take far too much time, as I was essentially handling each stitch three times. So I considered that first effort to be another swatch – a really big circular swatch – and frogged it, only to start again on circular needles, but back and forth this time. I made up a bunch of butterfly skeins, to minimize the chances of tangling, then started on the same provisional cast-on that I used for the first effort. It feels great to finally get started on this project. This is wonderful information! 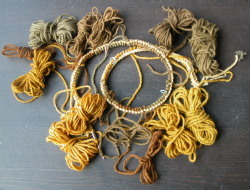 I have only started to explore dyeing with natural materials, although I have had an interest in it for several years. I can’t wait to search our bush for treasure! Also, I just found the Alberta Fungal Database, which is fantastic and I am excited to see that several of the fungi you mention have been found within a few hours of me. 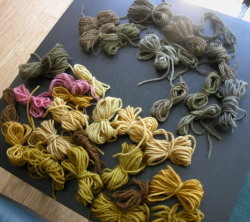 Thanks for your comments – mushroom dyeing is truly gratifying, especially as it’s so seasonal. I lived for a few years in the foothills east of Jasper (in Hinton), but that was long before I developed an interest in mushrooms – I’d like to go back during the season and see what grows around there. 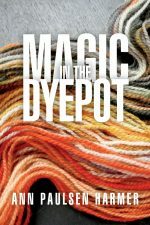 Good luck with your handspun sweater. I embarked on a similar project a few years ago, starting from the raw fleece, and now the sweater is almost done, but I’ve had to put it aside so I can finish my mushroom sweater in time for Sweden in September. Stay in touch – I’m curious to see what results you get from mushrooms.